Shahid Afridi, popularly known as Lala or Boom Boom, is one of the most popular cricketers to have ever played for Pakistan. He is undoubtedly the biggest name to have played for the country in the 2000s. Throughout his 16-year international career, Shahid Afridi played the game with unparalleled pride and passion. 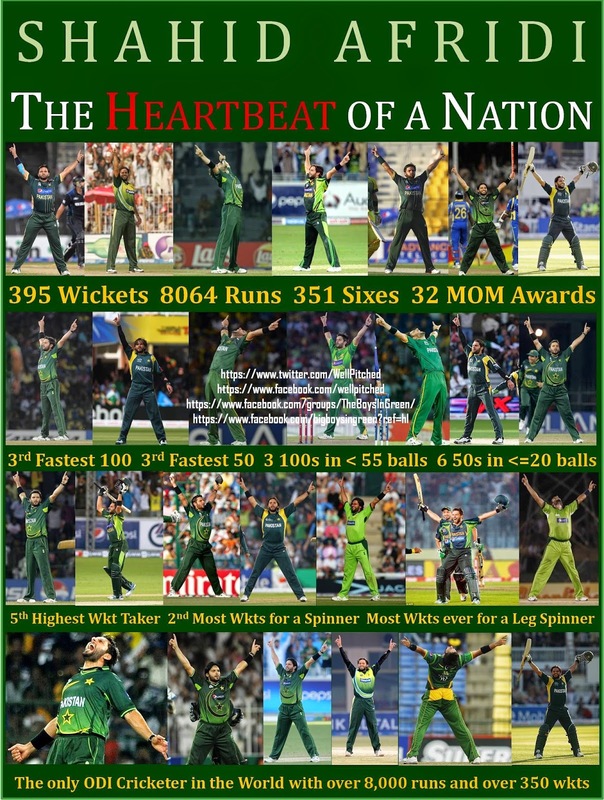 As his career draws to a close, he remains the heartbeat of the nation and the biggest limited overs match winner ever produced by Pakistan. His Cricinfo profile at one time used to state that “Afridi is the maddest of all mad maxes”. He himself has publicly stated that he would like to be remembered as “the craziest cricketer to have ever played for Pakistan”. Those are strange words to describe a cricketer, but probably apt for someone like Shahid Afridi. There have been plenty of mad moments and crazy antics that have been a part of Afridi’s international career such as roughing up a pitch with his spikes, biting the ball, several international retirements and comebacks, punching a fan, and speaking openly about issues with the board and management. Yet these are not the reasons why Afridi will be remembered by the world. For the cricket loving nation of Pakistan, Shahid Afridi is a hero. He is a proven match winner who single handedly won matches for Pakistan with the bat, with the ball, and even through his fielding. His 32 man-of-the-match awards in ODIs, the highest ever among all Pakistan cricketers and third highest in the world, is a testament to Afridi’s match winning ability. His 9 man-of-the-match awards in T20Is is the highest number of awards in the history of the T20 format. Afridi will be remembered as Pakistan’s most valuable ODI player and a giant of the T20 game. He captained an average team to the semifinal of the World Cup in 2011 where he was the joint leading wicket taker of the tournament; he was the player of the tournament of the World T20 in 2007 where Pakistan ended as runners up; he was the main architect of Pakistan’s victorious World T20 campaign in 2009 where he was the man-of-the-match in both the semifinal and final. His test career, however, remained unfulfilled despite a debut 5 wicket haul against Australia and a magnificent century in his second test (against India). His figures suggest that he was a much better test cricketer than he was an ODI or T20 one, but his temperament got the better of him in the longer format of the game. Under better guidance and management, Afridi would have had a much more illustrious test career; he definitely demonstrated the potential for one in the 27 tests that he played. Afridi’s international career began in 1996 when he was touring the West Indies with the Pakistan under-19 team and he received an SOS from the PCB to take the next flight out and join the senior team in Kenya for a quadrangular tournament where Mushtaq Ahmed had become injured and the team required a leg spinner. In less than a year prior to that, Afridi had developed a reputation of being a dangerous leg spinner in domestic and U19 cricket. With less than a year of first class experience, Afridi had donned the Pakistan cap. Afridi made his debut against Kenya bowling 10 overs for only 32 runs without picking up a wicket. He was slated to bat at number 9 in that match but his turn never came. During a net session before Pakistan’s next match, Saeed Anwar witnessed a side of Afridi that probably no one else had ever seen. Waqar Younis, Azhar Mahmood, Shahid Nazir, and Saqlain Mushtaq were deposited to all corners of the ground as Afridi threw his bat around in the nets. On seeing the carnage first hand, Saeed Anwar, who was captaining Pakistan in Wasim Akram and Aamir Sohail’s absence, took the decision to send Afridi as a pinch hitter in their next match against Sri Lanka. History was made when Afridi walked out to bat at number 3 in his first ever international innings. Afridi was at the crease for a total of 50 minutes, during which he produced the most destructive ODI innings ever played at the time. He smashed Chaminda Vaas, Muralitharan, and Jayasuriya to all corners of the Nairobi Gymkhana Club Ground and smashed 102 runs of 40 deliveries. His century, which came off only 37 deliveries, remained an ODI record for 18 years till it was broken by Corey Andersen, and then again by AB De Villiers. Pakistan had to put up a big total and defeat Sri Lanka with a heavy margin to make it to the final of the quadrangular tournament, and it did just that thanks to Afridi’s belligerent knock. Pakistan’s total of 371 in that match was their highest ever total in ODIs, till it was over taken by their 385 against Bangladesh in 2010, which was also due to an Afridi century. Afridi created records from the moment he stepped on to the field as an international cricketer, and he continued making records throughout his career. He has had an illustrious career, but nobody knows what it could have been like had he not been mismanaged at the start. Afridi was a regular leg spinner when he hit that fastest ODI hundred, following which he became Pakistan’s regular opener. His coaches, captains, colleagues, and their mothers wanted him to smash the leather around every time he walked out to bat. Soon everyone forgot that he was essentially a leg spinner and the PCB employed the likes of Javed Miandad and Geoffrey Boycott to help Afridi become a proper batsman. Unrealistic expectations, due to one magical innings, changed Afridi’s life forever. After a while he himself did not know whether he was a bowler who could bat a bit, or a batsman who could bowl a bit. He never became a proper batsman and his bowling suffered due to a lack of attention. If it were anyone else, their career would have ended a long time ago given the sort of pressure Afridi used to be under. But it was Afridi, a man made of steel, a man with more pride than a whole nation combined, a man who gave it his all every single time he stepped out in his green colors. Despite the failures, the pressure, and the constant speculation about his place in the team, Afridi went back to his roots and mastered the art with which he began his career – leg spin. For the period between January 2008 and December 2012, Afridi was the highest ODI wicket taker in the world. Since January 2007, Afridi has the third highest number of wickets in ODIs and is one of the only three bowlers in the world with 200 ODI wickets since then. With 395 ODI wickets, Afridi is the 5th highest ODI wicket taker of all time, 3rd highest ODI wicket taker for Pakistan behind Wasim Akram and Waqar Younis, 2nd highest ODI wicket taker among spinners behind Muttiah Muralitharan, and the highest ODI wicket taker among leg spinners. For a long time Afridi was the leading wicket taker in T20 internationals; currently he is at third spot behind two of his countrymen – Saeed Ajmal and Umar Gul. Afridi is the only cricketer in the world with over 8,000 runs and over 350 wickets in ODIs. His critics say that he is the slowest to 8,000 runs in ODIs. In terms of average, he surely is. Far slower than the rest. But everyone forgets that he is also the fastest to 8,000 runs, in terms of Strike Rate. Far faster than everyone else. Afridi is at the end of the road of his international career. He gave up test cricket in 2010, and after 19 years he has left the ODI game as well. He will continue to play T20 cricket for Pakistan till the World T20 in 2016, and we will still be treated to some more of Afridi for another year. And then he will be gone forever. Pakistan will never have another Shahid Afridi. The fans will never cheer again the way they cheered for Shahid Afridi. Afridi will always be remembered as one of the best produced by Pakistan, by far the most popular cricketer to play for Pakistan, and the biggest limited overs match winner ever produced by Pakistan. Shahid Khan Afridi, you will be missed!